The Wolves (6-8) take on the Milwaukee Bucks (7-6) tonight at 7:00 PM CST at Target Center. Milwaukee started 6-2, and leads the Central Division. But the Bucks are fading, having lost four of its last five game. Having gone 1-6 in their last 7, the Wolves are a half game out of the cellar. Injuries are again the key story. Don’t think defense is fun to watch? 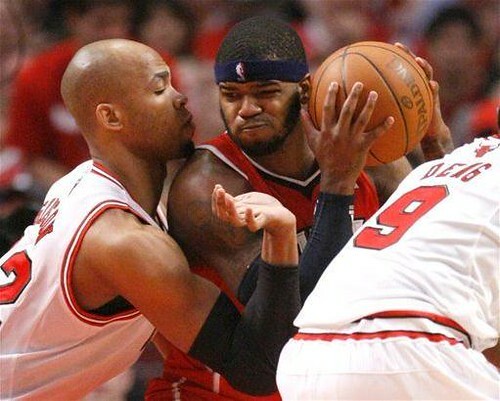 Maybe you haven’t seen Taj Gibson play it. Patrick J and I are doing a series on players you’ll be watching for one reason or another this season on League Pass. Timberwolves fans are naturally less familiar with Eastern Conference teams and players. This is one reason of many why League Pass is a worthwhile purchase and use of time. The following is my ALL-LEAGUE PASS TEAM, Eastern Conference style. Oh, and remember the discussion surrounding Rookie Blake Griffin’s eligibility for both the Rookie Game and the regular All-Star Game? At Punch-Drunk Wolves, rookies only get one team — so the rookies Pat described here and here are INELIGIBLE.